Saturday I had planned to drive all the way to Prudhoe Bay on the Dalton Highway. I started the drive late in the afternoon after driving to Fairbanks from Wasilla. The road starts out paved for about 70 miles then turns to gravel. 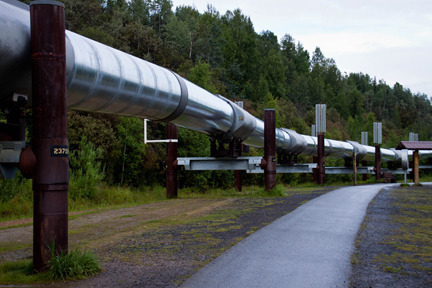 The Alaska Pipeline runs parallel to the highway beginning in Prudhoe Bay and ending at Valdez at the port. Anyway, I started here…at the visitor’s center for the pipeline. 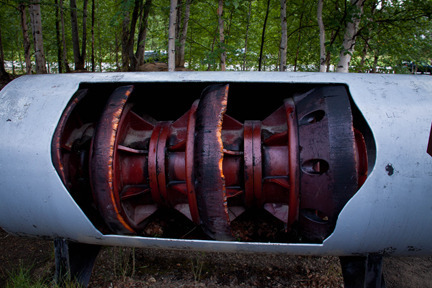 In the cutaway shot, you’ll see an example of the inside of the pipeline. 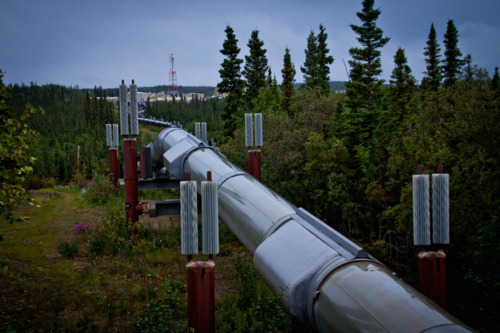 The oil travels the length of the pipeline but with it are “pigs” that perform varies jobs. This example helps smooth the flow of the oil and cleans the inside of the pipeline, too. Other “pigs” are magnetized and measure the change in the thickness of the pipe. There are also other “pigs” that perform other technical jobs. Some places along the Dalton, the pipeline runs close to it and is clearly visible. Other places it’s some distance from the highway hidden by the trees. 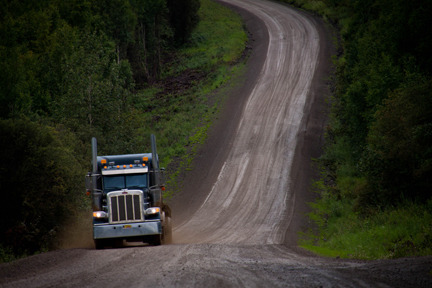 The primary purpose for the highway is to be a haul road for supplies to the oil refinery at Prudhoe Bay. 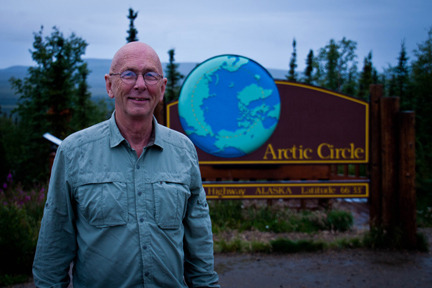 If you drive the entire length of the highway, it ends in Deadhorse and in order to see the Artic Ocean you must sign up for a 2-hour, $45 tour and reserve a minimum of 24 hours in advance with your name and either driver’s license or passport information so the BP can do a security check. This photo doesn’t due justice to the term “gravel” road. It was raining (surprise, surprise) on Saturday. My truck was covered in mud about a mile into the trip. Anyway, I decided that I was going to end my drive at the Arctic Circle. Most of the road was driven at between 35-40 miles per hour. Occasionally, I could push it to 50. Most of the trucks were doing 50 or better. I wanted to get to the Arctic Circle before dark so I could take a picture. This was a 10:30pm. It’s still light out. My map showed a dotted line where the Arctic Circle was but all I found was this sign. I headed south and camped about 15 miles south of the circle. I was warm but it got a little cooler than most of the other nights I’ve been out. Along the coast and in Anchorage it gets cold but not as cold as it gets more inland in Fairbanks. Winters there can get -50. Sounds delightful!!!! 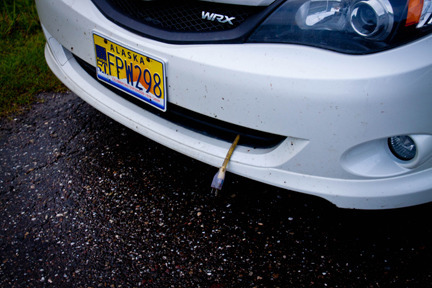 By the way, this isn’t an electric car. This is how they keep them warm enough to start in the morning. On my next blog, we’re going to visit the North Pole.